Bring your family and friends to stay in Valhalla (Mountain Paradise) at 9,318 feet above sea level in Silverton, Colorado! 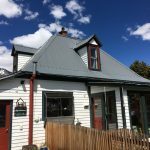 Our 1898 Miner’s remodeled home on a huge corner lot with 4 bedrooms and 2 baths awaits your discovery. The property is located on the old “Poverty Flats” of the 1890’s where the first Black Miner built this sturdy home for his family. 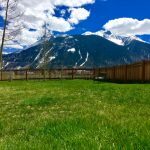 The irony is that the Grandest Views of the Valley are located on Poverty Flats with stunning vistas of 5 towering San Juan Mountains right from the living room and kitchen areas. laundry room and a steam / shower comfortably seating 3 for those apres-ski or after hike warm-ups. The main floor has a modern kitchen, a large oak dining table, and a living room that features a Massage Chair, seating for 8 and a wall hung TV with satellite services. The living room opens onto The San Juan Sunroom – an intimate Victorian sitting room with floor to ceiling windows providing one of the most stunning mountain views in Colorado – just right for morning coffee or an evening drink! The oversized corner yard is completely fenced making Valhalla a dog friendly retreat. A large barbeque, comfortable outdoor furniture, aspen and spruce trees, and summer wildflowers provide an alpine haven for family & friends barbeques and outdoor living. Valhalla has off-street driveway parking for 4 vehicles and fence-side parking for 4 more. ▪ Address: 1619 Mineral Street – drive north straight thru town just past historic San Juan County Courthouse; make a right on 16th Street and go 2 blocks to corner of 16th and Mineral Streets. ▪ Sleeping: 4 bedrooms plus Queen size sleeper sofa – 10 people. ▪ Safety: Home has been completely re-wired with modern electricity, plumbing upgraded, and thoroughly insulated. ▪ Seasonal Renting: Summer and Autumn for hiking, wildflowers, mountain or road biking, Jeeping, mountaineering, trout fishing and Fall elk and deer hunting. Winter and Spring for downhill skiing, backcountry skiing, cross country skiing, ice-climbing and snowmobiling. o Winter: December, January, March – $1,250 weekly; $250 nightly, minimum of 3 nights. o Spring: April and May – $1,000 weekly – $200 nightly, minimum 4 nights. ▪ Core Summer Months: June, August, September – $1,400 weekly, $350 nightly, minimum 3 nights. o July: $1,600 weekly OR $400.00 nightly minimum 4 nights. ▪ Silverton Tap Water voted best tasting in Colorado!